I am teaching Bible fellowship on May 26th and here are my teaching notes. It is from an amazing section of Scripture where Paul gives his last charge to Timothy during tough times in and outside the church. Paul’s last solemn words and exhortation in II Timothy ring loudly to the church and men and women who want to stand and serve the Lord Jesus Christ in our times. It is his final charge to the young pastor Timothy on whose shoulders he was placing the care of all the churches. 1 1In the presence of God and of Christ Jesus, who will judge the living and the dead, and in view of his appearing and his kingdom, I give you this charge. Walter Lock – International Critical Commentary-You have followed me loyally thus far: I charge you to follow me further, and to remain true to the truth until the end. As in the sight of God and of Christ Jesus who shall come to judge us all whether living or dead, as you would be ready to welcome His Appearing, as you would hope to share His Kingdom. Solemnly charge (diamarturomai from diá = intensifies meaning conveying idea of “thoroughly” + martúromai = witness, bear witness) means to bear witness, testify earnestly or repeatedly, to charge as it if before witnesses (here God and Christ Jesus), to exhort earnestly and with authority in matters of extraordinary importance (here the integrity of the message proclaimed). It carries the idea of giving a forceful order or directive. In the Greek it was used to call the gods and men to witness. Paul is seeking Timothy’s undivided attention to the matter at hand. Presence(enopion – from en = in + ops = face, eye, countenance) and so literally meaning in the face of, in front of, before or in the presence (sight) of and used primarily by Luke, Paul and John (in the Revelation). Being in sight. Before the face and thus the idea of face to face! Of doing something in someone’s presence. What an awesome solemn charge in the presence of God and our Lord Jesus Christ. It is a like a solemn charge and order sounding out from the court of God. 2Preach the Word; be prepared in season and out of season; correct, rebuke and encourage—with great patience and careful instruction. Phillips: to preach the Word of God. Never lose your sense of urgency, in season or out of season. Prove, correct, and encourage, using the utmost patience in your teaching. Wuest: make a public proclamation of the Word with such formality, gravity, and authority as must be heeded. Hold yourself in readiness for this proclamation when opportunity presents itself and when it does not; reprove so as to bring forth conviction and confession of guilt; rebuke sharply, severely, and with a suggestion of impending penalty. Pleadingly exhort, doing all this with that utmost self-restraint which does not hastily retaliate a wrong, and accompany this exhortation with the most painstaking instruction. Amplified: Herald and preach the Word! Keep your sense of urgency [stand by, be at hand and ready], whether the opportunity seems to be favorable or unfavorable. [Whether it is convenient or inconvenient, whether it is welcome or unwelcome, you as preacher of the Word are to show people in what way their lives are wrong.] And convince them, rebuking and correcting, warning and urging and encouraging them, being unflagging and inexhaustible in patience and teaching. Preach (kerusso or kerysso from kerux/keryx = a herald – one who acts as the medium of the authority of one who proclamation he makes; kerugma = the thing preached or the message) means to proclaim (publicly) or to herald or a public crier – the town official who would make a proclamation in a public gathering. It means to proclaim a message as a herald did in the ancient days before radio and television. The Imperial Herald would enter a town in behalf of the Emperor, and make a public proclamation of the message which his Sovereign ordered him to give, doing so with such formality, gravity, and authority as must be heeded. He gave the people exactly what the Emperor bade him give, nothing more, nothing less. This should be the example and pattern for present day preachers of the gospel. We are not to add to or water down the Gospel of God! The original meaning of the root word kerux was a “herald at the royal court.” Homer used kerusso and kerux in this connection. They not only announced the coming of the prince, but they also carried his commands to the uttermost corners of his realm. As the government of Greece became more republican, these heralds came to serve the state rather than the court. Certain qualities were required of heralds. They must have powerful voices, so voice auditions were often held. The herald was to make his announcements in a loud, clear voice so everyone could hear. This brings to mind the picture of the herald crying loudly and clearly “Hear ye, hear ye”. In a world of itching ears, Preach the Word! To a generation gone astray, Preach the Word! In a time of moral crisis, Preach the Word! When people don’t want to hear you, Preach the Word! When false teachers abound, Preach the Word! In good times and in bad times, Preach the Word! When people listen and when they don’t listen, Preach the Word! Urgent is the Authorized Version translation which vividly conveys the idea of pressing on with necessity. Be ready (ephistemi from epi = upon + histemi = stand) means to stand by, be at hand, be present. Hold yourself in constant readiness to proclaim the Word. The KJV “be instant” emphasizes the ideas of urgent, importunate (pressing or urging in request or demand) and persevering. In the the aorist imperative, ephistemi conveys the ideas of urgency, preparedness, and readiness, as of a soldier ready to go into battle on a moment’s notice or a guard who stands continually on alert for threat of enemy infiltration or attack. In broadcasting terms the idea would be “Stand by –You’re on the Air'”. Paul is commanding Timothy to “take a stand, to stand upon it or up to it, to carry on, to stick to it”, proclaiming the truth regardless of whether the circumstances are difficult or easy. Be at your work, attend to it always, in and out of season, letting nothing stop you Be always ready and always at hand. Like a good soldier of Christ Jesus. We must always be on duty. Like a good soldier, Timothy (and us) was to always be at his post, alert to embrace every opportunity of making known the gospel (not just the gospel that saves the first time [justification], but the gospel as it pertains to present tense salvation or sanctification). The idea here is that a preacher is not just to play at preaching. Rather, it must be a life consuming passion. He is never off duty. All his life and his walk with God go into the preaching of the Word, because biblical preaching is God’s truth imparted through a man who walks with God. “Be ready” imparts a further sense of urgency. Picture a paramedic unit on call, ready to save someone’s life. Souls are perishing without Christ. Christians are straying from the fold. Proclaim God’s Word whenever and wherever you can! In season (2122) (eukairos from eu = good + kairos = season, opportune time, “window of opportunity”) is an adverb modifying “preach” and means opportunely (the “right time”) or conveniently. Out of season (171) (akairos from a = without + kairos = opportune time) which as an adverb (modifies “preach”) means inopportunely, unfavorably, unseasonably, inconveniently, untimely. This is the only use of akairos in Scripture. REPROVE-means to bring to the light (to reveal hidden things) with the implication that there is adequate proof of wrongdoing. To expose, to convict, to reprove, to shame or disgrace and thus to rebuke another in such a way that they are compelled to see and to admit the error of their ways. To show someone that they have done something wrong and summon them to repent. A preacher must make an appeal to the reason of the hearers: “Reprove.” The word is a legal term that means to present your case in such a manner as to convince your opponent of his wrong. A preacher must not simply give an emotional harangue. He must present his case in a logically convincing manner from the Word so that his hearers are persuaded that what it is saying is right even when their behavior is wrong. REBUKE– Epitimao is stronger than the previous word reprove implying more authority and less argument, thus conveying the idea of censure, including a sharp, severe reprimand with possibly a suggestion in some cases, of impending penalty. It also is used of speaking seriously or warning in order to prevent an action or bring one to an end. To rebuke in English means to criticize sharply (reprove sternly) while reprove means to scold or correct more gently or with kind intent. Exhort (parakaleo from para = beside + kaleo = call) (aorist imperative – Do this now! Don’t delay! It’s urgent!) conveys the basic idea of calling one alongside to help or give aid. Because a person can be called alongside for many purposes, the meanings include admonish, comfort, or encourage. In the context admonish may be nearest the original meaning. The patience preacher must give tender, sympathetic admonition and encouragement to the fainthearted and the discouraged. a preacher must make an appeal to the will and emotions of the hearers: “Exhort.” The word has the nuance of encouraging someone to right behavior. Some people need rebuke and some need encouragement. If you encourage those who need rebuking, you assist them to go on sinning. But if you rebuke those who need encouragement, you’ll discourage them. Someone has said that the preacher’s job is to comfort the disturbed and disturb the comfortable. Patience (makrothumia [word study] from makros = long, distant, far off, large + thumos = temper, passion, emotion or thumoomai = to be furious or burn with intense anger) is literally long-temper (as opposed to “short tempered), a long holding out of the mind before it gives room to action or passion. It describes a state of emotional calm or quietness in the face of provocation, misfortune or unfavorable circumstances. Makrothumia is the capacity to be wronged and not retaliate. It is the ability to hold one’s feeling in restraint or bear up under the oversights and wrongs afflicted by others without retaliating. It is manifest by the quality of forbearance under provocation. It is used of God’s patience toward sinful men (Ro 2:4) and of the attitude which Christians are to display.
. The preacher of the word is to exhibit emotional calm in face of provocation, injustice or unpleasant circumstances without complaint or irritation. Such an attitude is possible only one allows “the Word of Christ to richly dwell within” (Col 3:16-), which makes us “adequate equipped for every good work” (2Ti 3:17) and brings forth “the fruit of the Spirit” which includes “patience” (makrothumia) (Gal 5:22). Instruction (didache [word study] from didasko = to give instruction in a formal or informal setting with the highest possible development of the pupil as the goal; English = didactic = intended to teach, particularly in having moral instruction as an ulterior motive) is a noun which describes the activity of teaching (instruction). Didache means instruction by mouth with intent to influence the understanding and thereby to shape their will. Great (all)..instruction is to be the aim of our teaching, the whole counsel of God’s word and especially the pure Gospel, not just a few bits of doctrine here and there. All proclamation must include sound doctrinal teaching for without it there is no conviction of sin and no repentance. 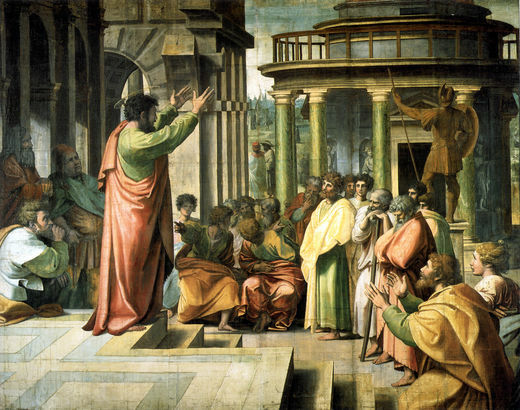 By applying human reason, logic, and wisdom, gifted orators can move audiences by the power of their persuasive speech. But no man can be a faithful preacher without preaching the Word. 4They will turn their ears away from the truth and turn aside to myths. Time (kairos ) is not merely a succession of minutes as in the word chronos (chronological referring to clock or calendar time), but instead refers to a season, a decisive epoch, an era or a fixed, definitive period of time when events are brought to a crisis. Kairos refers to those strategic times in the calendar of God during which events come to a culmination and ripen to usher in a new age. Therefore kairos can refer to a period of opportunity and when the period of time passes so does the opportunity. a critical, epoch-making period foreordained of God when all that has been slowly, and often without observation, ripening through long ages, is mature and comes to the birth in grand decisive events, which constitute at once the close of one period and the commencement of another. will not tolerate wholesome instruction (Berkley). Our derivative words in English include hygiene or hygienic which define the conditions or practices conducive to good health…ponder that fact in the context of Paul’s use in this verse. Sound doctrine is teaching which continually (because the verb is present tense indicating continuous action) protects and preserves the spiritual life of the one who partakes and which makes the whole man healthy, “equipped for every good work” (2Ti 3:16, 3:17–note). Will turn aside (ektrepo from ek = out + trope = a turning) means literally to turn out (of the course) and so to turn aside (so as to avoid being involved). To turn away from, to swerve, to shun, to avoid meeting or associating with one. To turn a person off the road. It can literally mean to twist out (He 12:13–note). In secular Greek medical literature described a dislocated joint, one that is sprained or wrenched! This meaning gives one a picture of the minds and hearts of those who reject God’s Truth as ending up spiritually “dislocated”, knocked out of joint, a far worse state than a physical dislocation! Verse 5-But you, keep your head in all situations, endure hardship, do the work of an evangelist, discharge all the duties of your ministry. be steady in all things (Barclay). Be sober (nepho) means literally to abstain from wine and as used metaphorically here means to be free from every form of mental and spiritual ‘drunkenness’, from excess, passion, rashness, confusion, etc. and so to be well-balanced and self-controlled so as to keep a keep a cool, calm, and collected mind. The present imperative commands Timothy to make this his standing so that he is continually on alert, yet calm and circumspect regardless of the season. This alert wakefulness and calm assurance would protect him from being surprised and confused when those who professed Christ turned away from the word of Christ and unto myths of men. to be in a vigilant, wakeful, considerate frame of mind, taking heed of what is happening and pursuing a course with calm and steady aim. is aorist imperative which speaks of a sharp command given with military snap and curtness. Timothy needed just that…. fill up the full measure of thy ministry.. Fulfill (plerophoreo from pleres = full + phoréo = fill) is literally to fill full and here is a command for Timothy to accomplish his ministry fully and wholeheartedly. Timothy was to carry out his ministry to its end, completing all its demands and requirements. Again the the aorist imperative is a command calling for Timothy to carry out this order with immediacy and effectiveness. I thank Christ Jesus our Lord, who has strengthened me, because He considered me faithful, putting me into service (diakonia). Phillips: The glorious fight that God gave me I have fought. The course that I was set I have finished, and I have kept the faith. Wuest: The desperate, straining, agonizing contest marked by its beauty of technique, I like a wrestler have fought to the finish, and at present am resting in its victory. My race, I like a runner have finished, and at present am resting at the goal. The Faith committed to my care, I like a soldier have kept safely through everlasting vigilance, and have delivered it again to my Captain. Agonizomai means to exert oneself, to fight, to labor fervently, to strive (devote serious effort or energy = implies great exertion against great difficulty and suggests persistent effort), to struggle, to contend with an adversary – all of these actions picturing an intense struggle for victory. When we find that the gloves of the Greek boxer were fur lined on the inside, but made on the outside of ox-hide with lead and iron sewed into it, and that the loser in a wrestling match had his eyes gouged out, we come to some appreciation of what a Greek athletic contest consisted of and of the effort such a contest would motivate! Agonizomai here in second Timothy 4 is in the perfect tense which indicates a past completed action with ongoing effect and thus pictures the contest as having begun with intensity (the moment Paul was saved the “bell rang” beginning “round one”!) and which persisted to the end of his life. The use of this verb implies hindrances in the development of the Christian life. Paul is reminding us that faithful Christian ministry is not easy. It takes courage and expenditure of great effort to run the Christian race successfully, albeit that effort ultimately being in the power God supplies.). Paul’s entire life had been given fully to the struggle even as Olympic athletes give their body, mind and spirit full to their specific sport. Finished (teleo from telos = goal, consummation, the end or final purpose to which all the parts tend and in which they terminate) means to make an end of, to accomplish or to complete something. Teleo is in the perfect tense emphasizing the permanence of the finish. The finish line has been crossed and the results would last forever. The idea Paul is conveying to Timothy and to all saints is not for us to merely end our life, but to bring our life (in Christ) to it’s destined goal, bringing to completion the individually unique and specific “course” that God has laid for each of His children to run. Wuest- Verse 8: Henceforth there is reserved for me the victor’s laurel wreath of righteousness, which the Lord will award me on that day, the just Umpire [the umpire who is always fair and never makes a mistake], and not only to me but also to all those who have loved His appearing and as a result have their love fixed on it. He Read His Own Obituary! –Alfred Nobel opened his newspaper one morning in 1888 and was shocked to read his own obituary. The fact was that Nobel’s brother had died, and a careless reporter had put the wrong man in the story. The incident left Nobel deeply disturbed for more than the obvious reasons. Through the erroneous obituary, he saw himself as the world saw him–a wealthy Swedish industrialist whose most enduring legacy was the invention of dynamite. Resolving to do something that would uphold his cherished ideals, Nobel used a portion of his great wealth to establish prizes that would reward people whose work benefited humanity. The Nobel Prizes were first awarded in 1901, and today they are still considered the most esteemed prizes in the world. The soul-searching that Alfred Nobel underwent as he reviewed his life is the same kind of self-examination Christians need to make regularly. Paul urged the Corinthians, “Examine yourselves” (2Cor. 13:5). Agapao is in the perfect tense which indicates they had fixed their love on His appearing at some time in the past and as a result were still in that condition, so it speaks of the permanence or steadfast maintaining of their love of His appearing. The idea is that they had fallen in love with His appearing and were still in love with it! This entry was posted in Bible Teachings and tagged apostasy in church, Apostle paul, christian service, fight the good fight, first century church, ii timothy, Paul, preach the word, run the race, the last times, timothy in bible. Bookmark the permalink.